Meniscus: The menisci are C-shaped fibrocartilaginous disks in the knee that serve to transfer load and absorb shock, aid joint stability and provide lubrication. Arthroscopy: is the examination of the inside of a joint, using a special illuminating instrument inserted through a small incision or ‘portal’. 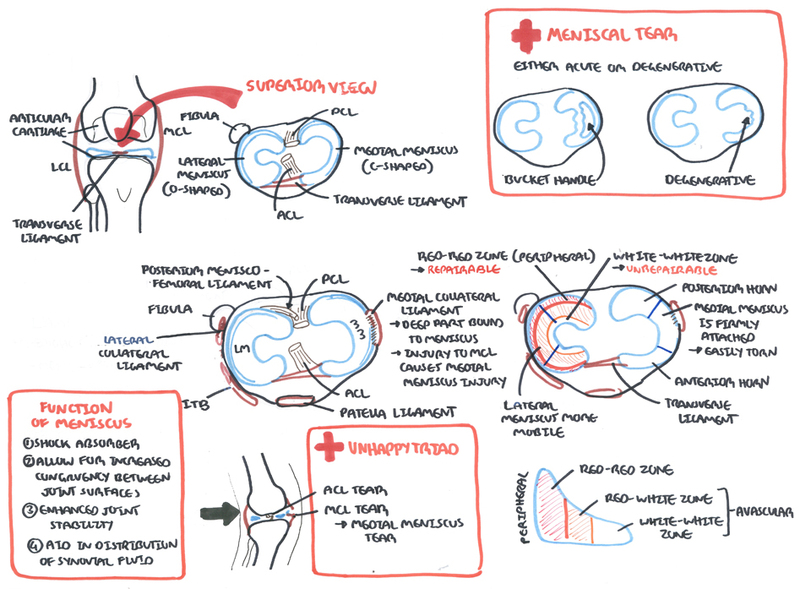 The knee joint is a synovial joint, in that it is encapsulated by the synovial membrane which produced synovial fluid. As the knee is a modified hinge joint it is structured to perform two principal actions, flexion (bending) and extension (straightening). The muscles which act at the knee are predominantly the quadriceps (extension) and the hamstrings (flexion). The knee can also do a bit of internal and external rotation. The medial meniscus is firmly attached to the joint capsule along its entire peripheral edge. The lateral meniscus there is a region posterolaterally where it is not firmly attached. Remember the medial meniscus has less mobility than the lateral meniscus and is more susceptible to tearing when trapped between the femoral condyle and tibial plateau. The lateral meniscus is larger – greater share of the lateral compartment pressure than the medial meniscus carries for the medial compartment. MRI – Magnetic resonance imaging is first line for investigating potential meniscal lesions, but should not replace thorough clinical history and examination. X-ray – Plain films of the knee may also show degenerative change, calcification of the meniscus, or calcified loose bodies. Meniscal tears can be classified either by etiology or by their arthroscopic and MRI appearance. Etiologic classification divides tears into either acute tears or degenerative tears. Small stable meniscus tears often become asymptomatic and do not need to be treated surgically. Those causing persistent symptoms should be assessed with arthroscopy.